My current research explores the possibilities and limits of Markov Chain Monte Carlo (MCMC) methods in dealing with posterior or quasi-posterior distributions that arise from high-dimensional Bayesian (or quasi-Bayesian) inference in regression and graphical models. I also have some interests in optimization, and these revolve around the use of stochastic methods: whether (and how) the use of stochastic methods can help tackle large scale optimization problems of interest in statistics. 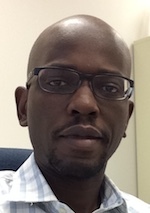 I also have interests in the use of remote sensing data to study social and environmental issues in Africa.